The agony and ecstasy of the maligned and saluted treaty process was on full display last week when hundreds of cheering people witnessed the signing of an agreement-in-principle on a southern Vancouver Island treaty after 20 years of talks. Premier Christy Clark’s Liberals refused to appoint former provincial cabinet minister George Abbott as the new chief of the B.C. Treaty Commission — the overseer of the federal, provincial and First Nations negotiation process — suggesting changes must be made. Federal Aboriginal Affairs Minister Bernard Valcourt is digesting a report from federal envoy Doug Eyford that recommends Ottawa approach treaties with a sense of urgency and consider which talks are progressing and which should be dumped. B.C.’s First Nations Summit, the province’s largest aboriginal organization, wants Ottawa and B.C. treaty negotiators to come to the table with the power to make decisions rather than being forced to retreat to back rooms for approval of every move. That convoluted plot line was evident at the signing ceremony Thursday when drums pounded, singers chanted and chiefs choked back tears as they honoured the commitment and sacrifice of leaders who spent years at negotiating tables. 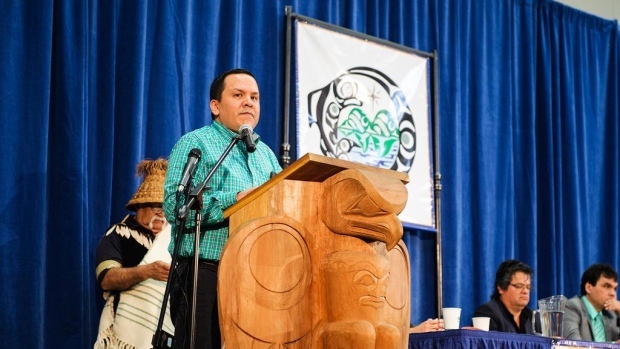 Songhees First Nation Chief Ron Sam described himself as somewhat of a treaty-table rookie, devoting only six years to negotiations. Twenty years to reach a deal is too long, said Sam. “These are good faith negotiations, so I think there needs to be some recognition of everybody’s role in the whole process and not have it bogged down in political aspects,” he said. First Nations Summit spokeswoman Cheryl Casimer said moves are underway to get the three sides to meet later this month. First Nations will tell the governments they need to pick up their pace if they want to speed up treaty settlements, she said. Four treaties have resulted from the modern-day treaty process that was launched in 1993. British Columbia is the only province that didn’t sign treaties with most of its more than 200 First Nations. A handful of bands signed agreements through the so-called Douglas Treaties in the mid-1800s. B.C. Aboriginal Relations Minister John Rustad said the current treaty process is in need of an overhaul where deals no longer take decades to achieve. Rustad said B.C. has achieved success with a stepping-stone approach to treaty making that involves reaching a series of smaller economic and land agreements that could eventually set the stage for final treaties. “I believe a process to reach long-term reconciliation can be founded in that type of approach,” he said. MP Mark Strahl, Valcourt’s parliamentary secretary, said his government plans to consult widely among First Nations about Eyford’s report, but he suggested the federal government isn’t about to make immediate changes to the process. Posted on April 12, 2015, in Uncategorized and tagged BC Treaty Commission, BC treaty process, self-government, Songhees First Nation. Bookmark the permalink. 2 Comments. And on top of all that signing a BC Treaty extinguishes Aboriginal rights and title fulfilling the mandate of the 1969 White Paper.